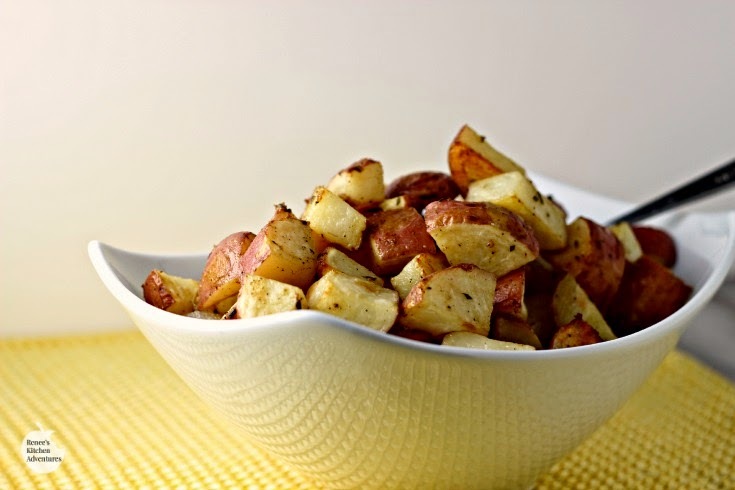 Roasted Rosemary Dijon Potatoes make a great side dish to go with just about anything! The rosemary and mustard combination give them a wonderful flavor! They come out of the oven with a tasty crispy outside and a tender inside...roasted potatoes never tasted so good! These potatoes are what I served as a side dish to those awesome Fall-Off-The-Bone Slow Cooker Ribs I made the other day! They really were and easy and tasty accompaniment. Sometimes I like to fuss in the kitchen with a fancy dinner, but most often I like to make easy, no fuss kinds of quick meals, especially on the weekdays. THIS recipe is one of those dishes. 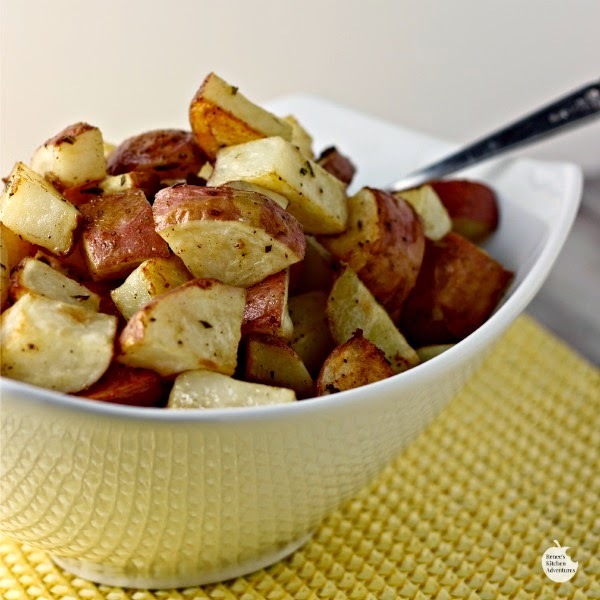 Not only is this a tasty side dish, but it's also pretty healthy and there is NOTHING like adding that fresh rosemary to these potatoes. NOTHING. Make sure you use fresh! Dried will do the trick ( you will need to use a lot less), but it tends to be woody and hard and I don't think has the same flavor as fresh. I'm so happy I, once again, have fresh herbs at my disposal on my patio. Red potatoes are the ideal potato for oven roasting. Not as starchy as a russet, so they bake up crispy with little effort. 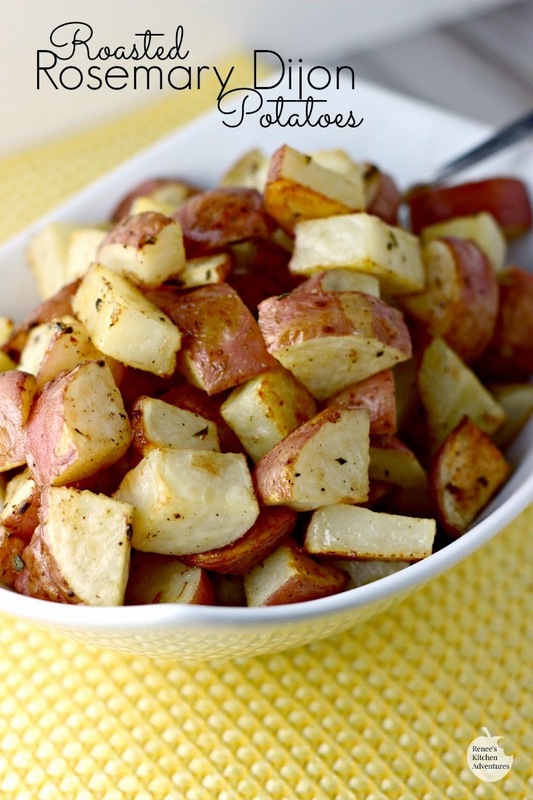 Make sure you use red potatoes in this recipe! They can be either large ones or baby ones. I know this side dish will be showing up on my table again this summer! What will you be serving these yummy potatoes with? Preheat oven to 450 degrees F. Spray large sheet pan with cooking spray. Roast for 20 - 25 minutes, mixing about halfway through cook time. Potatoes are done when they are fork tender and golden brown. I LOVE fresh rosemary on potatoes my mouth was watering like crazy looking at your pictures! I hardly ever roast my potatoes, but I obviously need to because they turn out so much better than frying them. thanks for sharing! thanks Sara! YES! Roasting is the way to go! Just make sure you leave enough space for them to roast and use that high temperature oven, and you'll have potatoes that look just like these!